For those of you that want to geek out for a minute, we would like to provide you with information on universal scanners. Of all the identified scanners in the market today, Avid’s patented universal readers, Home Again Universal scanner and Omni Max scanner by Datamars are the competitions for Peeva’s Universal Scanner. 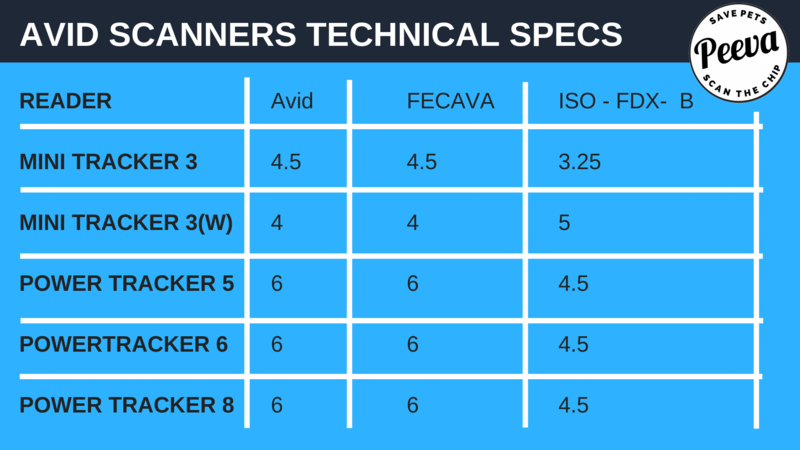 Below is given a brief summary of the tech specifications of the three brands. Microfindr™, Datamars™, PetLink™, Bayer resQ®, 24 Pet Watch™, AKC CAR/EID™, Αllflex®, Avid™, Banfield®, Crystal Tag™, Destron Fearing™, Digital Angel®, HomeAgain®, Lifechip®, Schering Plough™, Trovan®. Avid has three universal scanners of the form factors, Mini Tracker 3, Power Tracker 6 and Mini Tracker 3 Wand Reader. · Power: One 8.4v NiMH rechargeable battery with charger, or optional AC adapter. In addition to these, iMax Black Label by Datamars, distributed by Bayers Animal Health was also reported by the manufacturers to read (detect and display microchip number)125kHz(encrypted & un-encrypted), 128kHz and 134.2kHz; Trovan AKC CAR scanner could only read 125kHz (encrypted & un-encrypted) but only detect 134.2kHz. Pros – All the universal scanners from these manufacturers claim to scan microchips that operate at three different frequencies, viz., 125kHz, 128kHz and 134.2 kHz. But with reference to a journal on the sensitivity of commercial readers, “Sensitivity of commercial scanners to microchips of various frequencies implanted in dogs and cats”, Linda K Lord et al, published on December 1, 2008, universal scanners often failed to detect the presence of a microchip and this failure was associated with the weight of the animal, improperly implanted microchip or microchip lost after implantation - which is beyond the scope of our project. Cons – None of the above mentioned systems have the ability to pull up medical records instantly from the cloud over a wireless communication channel. The systems do not have a seamless user interface to obtain detailed information of the registered microchip from a registry (if a tab is proposed, minimal interaction with a desktop could be avoided). None of these devices have a Wi-Fi module (They have a USB, Bluetooth or both). None of the devices have a cloud compatible interface. In order to make the product stand out in the market, we have done a significant amount of research on improving the features/technical aspects and identifying the flaws in the existing scanners from a technical standpoint, and improving functionality of the product by adding services that will benefit the process. Please follow this link for some insight into the technology and manufacturers.